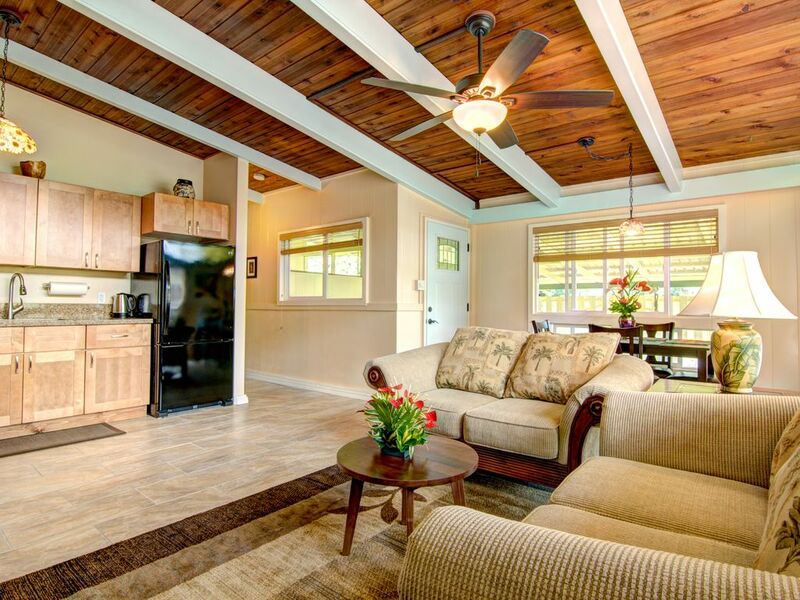 Hale Hibiscus is a brand new fully remodeled plantation style duplex. There are 3 sister units nearby that makes this a wonderful, quaint, quiet area perfect for either family reunions or a romantic getaway for 2. We do have a minimum age requirement of 10 years old. The rental property has agricultural land on 2 sides. Our house is further back on another lot on one side.On our 1 plus acre property there are various fruit trees such as avocado and lychee to citrus and mangosteen. there are bananas, papayas, passion fruit, sour sop and Tahitian lime to name a few. Ask which fruit is in season and available for picking. In just a few blocks you can be in downtown Hilo bay front, strolling shops, galleries, and restaurants. Its only about a 5 minute walk from your front door to downtown Hilo. The combination of closeness to town yet sitting in a quiet agricultural setting creates a unique vacation destination with the feel of old time Hawaii. We are within a ten minute drive of the University of Hawaii Hilo, Imiloa Astronomy Center, East Hawaii Culture Center, Tsunami Museum, and Lyman Museum to name just a few cultural destinations. We are less than 1 hour from Hawaii Volcanoes National Park, Akaka Falls State Park, and the famous Hawaii Tropical Botanical Garden. The rental itself is decorated with high end amenities. Quartz counters in kitchen and bath. There is porcelain tile flooring throughout. The shower is a walk in with a European shower/massage wall panel. This is an experience to behold !There are 6 adjustable jets for a shower massage or a rain tree shower. Both bedrooms have new Caspar mattresses . We provide cotton linens and cotton robes. All necessary utensils are handy in the kitchen for meal preparations. This is a full kitchen with range, microwave, and a full size refrigerator. A large flat screen TV is in the great room with 2 love seats and dining table for 4. Near the back door is a washer and dryer. Free Wi Fi ! Phil and I have been using Homeaway and VRBO for about 16 years with various other rentals on the island. We enjoy meeting guests from all parts of the world and will share what information and tips that we can. Phil is a retired teacher and I am semi retired. I had a Holistic Health Center in Alaska for 16 years which I provided with others many modalities of alternative care from Massage to Acupuncture to Reiki and NeuroMuscular Therapy. We found this place while looking for larger acerage in downtown Hilo. We first purchased a smaller parcel and then acquired these older rentals 3 years later when they came up for sale. It was the perfect arrangement. As all I guests tell us its the perfect location. Central to everything. Quiet with a country feeling. A very safe feeling. And quite beautiful especially when the mountain top glows in the early morning. Lots of fruit trees on the property with usually something in season to harvest. The unit was nice and clean. Very pleasant on a cool piece of property. The shower is very neat and definitely a bonus to the stay. Well-maintained, comfortable home on a beautiful property just a very short walk into town. For this who like to pack light, you have a washer & dryer too. I wish we wouldn't have been a day delayed in arriving! Very well furnished and clean. Easy walking to downtown. We found the Hibiscus hale well located and convenient for our visit to Hilo. Walked to dinner twice. Easy drive to see the Pahoa village, Pohoiki and lava cones. Cute and as described very nice host! We loved our stay in Hale Hibiscus! This cute two bedroom had everything we needed. Due to the fantastic restaurants within walking distance we never had the need to cook anything! We enjoyed our stay in this quiet neighborhood and would stay here again. Thank you Diane! Quiet, clean, with a bright, modern decor. Great location a few blocks from downtown Hilo, but in a green, quiet spot next to farm fields. Everything clean, fresh, and recently updated. Loved being able to pick tangerines in the backyard ! Good location, short walk to town, comfortable. Great hosts, cozy 2 bedroom and wonderful yard with varities of plants, fruit trees and hibiscus.